Polycystic Ovary Syndrome (PCOS) is a common endocrine-reproductive disease in females. PCOS patients show decreased ovary granular cells, which is possibly related with cell apoptosis. This study thus aimed to investigate the apoptotic mechanism in PCOS via measuring the protein expressions of apoptosis and anti-apoptosis related molecules in PCOS patients. A total of 30 PCOS patients were recruited in the disease group, in parallel with uterine fibroids patients as control group. TUNEL assay was used to determine the apoptotic index of ovary follicular granule cells. Immunohistochemistry (IHC) staining was performed to test the expressions of Bcl-2, Bax, Fas and Fas-L in various grades of follicular granules. PCOS group had higher apoptosis index of antral follicles compare to those in preantral follicles or primordial follicle (P<0.05). With time elapse, apoptosis index was gradually increased. PCOS group had higher apoptosis index in all grades of follicles compared with control group at the same time (P<0.05). Antral follicle had depressed Bcl-2 expression, and elevated Bax, Fas and Fas- L expressions compared with pre-antral, primordial follicles (P<0.05), or even control group (P<0.05). With time elapse, Bcl-2 expression was further decreased with elevated Bax, Fas and Fas-L expression in PCOS group (P<0.05). PCOS patients had elevated apoptosis of follicular granular cells, possibly resulting from down-regulation of Bcl-2 and up-regulation of Bax, Fas and Fas-L.
Polycystic Ovary Syndrome (PCOS) is a disease caused by endocrine disruption and metabolic disorder. Featured as ovulation dysfunction, PCOS is a major disease causing female infertility and menstrual dysregulation in clinic . In a hormonal perspective, PCOS patients may develop into hyperandrogenism, high luteinizing/follicle stimulating hormone levels, or hyperinsulinemias . Large amounts of small follicles exist in the ovary of PCOS patients, but lacking matured follicles, due to dysfunction of hypothalamuspituitary- ovary axis and possible dysregulation of ovary functions including follicle selection or follicular atresia . Cell apoptosis plays an important role in follicular development, mainly in egg production, oocyte degeneration, follicle selection or even follicle atresia. In reproductive-age females, apoptosis mainly occurs in follicular granular cells, indicating possible dysregulation of cell apoptosis in PCOS individuals [4,5]. An active process exists during apoptosis of follicular granules, which is correlated with caspase family and Bcl-2 family . Cell apoptosis can maintain the homeostasis of internal environment and is an important physiological process of cells. The apoptosis of granule cells is modulated by apoptotic receptors including Fas/Fas-L, in addition to Bcl-2 family . Current studies have revealed dual pathways for cell apoptosis: endogenous pathway, or mitochondrial pathway, which is mainly regulated by Bcl-2 family and exogenous, or death receptor pathway, which is mainly initiated by Fas/Fas-L and induced by cAMP [8,9]. Previous study has been performed by testing the expression levels of apoptosis related proteins Fas/FasL, Bcl-2 and Bax in ovary tissues from PCOS patients, but did not mention the expressional profiles of apoptosis related proteins in ovary follicular cells . This study thus investigated the apoptosis index of ovary granular cells from PCOS patients after surgery and monitored the expression levels of apoptosis/anti-apoptosis proteins Bcl-2, Bax, Fas and Fas-L in an attempt to illustrate the apoptotic mechanism in PCOS patients, as well as its relationship with disease occurrence, progression and treatment efficacy. A total of 30 PCOS women who received the laparoscpopic surgery in the First Clinical Medicine College of Yangtze University from January 2015 to January 2016 were recruited in this study. The age ranged from 25 to 40 y (average age=29.2 ± 3.5 y). Diagnosis criteria were as follows : (1) Any three of symptoms including oligomenorrhea, hirsutism, infertility and obesity; (2) Serum LH/FSH higher than 3.0, and/or abnormally high testosterone level; (3) More than 10 small follicles (less than 10 mm diameter) in unilateral ovary, accompanied with enlarged bilateral ovaries. Another cohort of 30 women with uterine fibroids (aged between 25 and 35 y, average age=28.5 ± 3.1) admitted in our hospital were recruited as a control group. No significant differences existed regarding age or body weight between these two groups, which were comparable (P>0.05). All participants signed written informed consents. This study has been approved by the ethical committee of the First Clinical Medicine College of Yangtze University. (1) Not using hormone drugs within 3 months; (2) No malignant lesion in ovary or uterus; (3) No severe liver/kidney disorder, autoimmune diseases. (1) Pregnant or lactation women; (2) Endometrial hypertrophy, cervicitis, or uterus inflammation; (3) Long-term user of hormone replacement treatment; (4) Other malignant disease of uterus, ovary and ovarian tubes. DMEM culture medium, streptomycin/penicillin, Foetal Bovine Serum (FBS) were purchased from Gibco (USA). Blocking buffer and primary antibody for Bcl-2, Bax, Fas and FasL, plus rabbit anti-mouse secondary antibody kit were purchased from Shanfeng Chem (China). Ultrapure workstation (Formal, USA); Inverted microscope (Olympus, Japan); Incubation chamber (Thermo, USA); CO2 incubator (SANYO, Japan); Cold centrifuge (Beckman, UK). After applying standard long/short protocol for ovulation, follicular fluid was collected via vaginal puncture. Follicular fluid was observed to separate Oocyte Coronary Colliculus Complex (OCCC) for in vitro fertilization and embryonic culture. Follicular fluids were centrifuged at 1000 r/min for 10 min to discard the supernatant in triplicates. 2 ml PBS+Percoll mixture was added and centrifuged again. Granular cells were then removed from the upper phase and mixed with 30 ml 8.4 g/l NH4Cl followed by 37°C vortex and centrifugation. PBS was used to re-suspend cells and filtered to obtain single cell suspension. Concentration was adjusted to 1 × 106 per ml. 1 ml cell suspension was then centrifuged, and was re-suspended in DMEM containing 10% FBS and penicillin-streptomycin. After 48 h incubation in culture dish, cells were fixed in paraformaldehyde and were kept at -80°C. TUNEL assay was performed following the manual instructions. Tissues were prepared into paraffin-based sections (4 μm thickness). After de-waxing, tissue sections were rinsed in PBS, and incubated with 0.2 M HCl at room temperature for 10 min. Proteinase K was used to process tissues, followed by addition of TUNEL substrate. After 1 h incubation at room temperature, Conventer-AP was added for 30 min incubation at room temperature, followed by 20 min dark incubation. The reaction was stopped, followed by dehydration and mounting. Apoptotic nucleus showed dark blue staining, 10 fields were randomly selected for observation under high magnification. The percentage of apoptotic granular cells in each phase of follicles was identified as apoptotic index. Granular cells were mounted onto glass slides for 30 min at room temperature in 1% Triton-100, followed by 3% H2O2 incubation for 30 min at room temperature. Blocking reagent was added, for 20 min room temperature incubation, followed by addition of primary antibody (1:100 dilution) and subsequent incubation at 4°C overnight. On the next day, secondary antibody was added for 30 min room temperature incubation, with the addition of SABC20. DAB substrate was added for developing. Hematoxylin counter-staining was then performed, followed by 1% HCl-ethanol differentiation, dehydration and mounting. 5 fields were randomly selected to count 100 cells. Negative staining (-) was identified as no brown granules inside cytoplasm. Weak positive (+) was identified as light brown granules inside cytoplasm. Positive (++) was identified as clear brown granules inside the cytoplasm. Strong positive (+++) was identified as strong brown granules inside the cytoplasm. Primordial follicle: Consisted of primary oocyte and peripheral single layered granular cells, with diameter 0.03~0.06 mm. Pre-antral follicle: Enlarged primary oocyte and cubic granular cells in peripheral region, with diameter 0.06~0.20 mm. Antral follicle: Fusion of follicular fluid between granular cells to form follicular cavity, which consists of egg colliculus granular cells and basal membrane granular cells, with diameter as large as 16 mm. SPSS 17.0 software was used for data analysis. Measurement data were presented as mean ± Standard Deviation (SD) and were compared by analysis of variance, while enumeration data were assessed by chi-square test . A statistical significance was defined when P<0.05. TUNEL assay was used to measure the apoptotic index of follicular granular cells at all phases . Results showed higher apoptosis index of antral follicles in PCOS group compared with that of pre-antral or primordial follicles. Preantral follicles had higher apoptosis index than primordial follicles (P<0.05). At 12 h, 24 h and 48 h, apoptosis indexes of all phases of follicles were significantly higher in PCOS group with extended time (P<0.05). At the same time point, PCOS group had higher apoptosis index at all phases of follicles compared with control group (P<0.05, Figure 1). Figure 1: Apoptosis of follicular granular cells by TUNEL assay. aP<0.05 compared to PCOS primordial follicle; bP<0.05 compared to PCOS pre-antral follicle; cP<0.05 compared to controlled primordial follicle; dP<0.05 compared to controlled pre-antral follicle; eP<0.05 compared to controlled antral follicle; fP<0.05 compared to 12 h group; gP<0.05 compared to 24 h group. The expressions of Bcl-2, Bax, Fas and Fas-L in follicular granular cells were tested by IHC staining. Results showed lower Bcl-2 and higher Bax, Fas and Fas-L expression levels in antral follicles compared to those in pre-antral or primordial follicles in PCOS group (P<0.05). PCOS patients had lower expression of Bcl-2 and higher expressions of Bax, Fas and Fas-L in all phases of follicles compared to those in control group (P<0.05). When comparing among different time points, with elongated time, Bcl-2 expression was gradually decreased, while Bax, Fas and Fas-L expressions were elevated (P<0.05, Table 1 and Figure 2). Note: aP<0.05 compared to PCOS primordial follicle; bP<0.05 compared to PCOS pre-antral follicle; cP<0.05 compared to controlled primordial follicle; dP<0.05 compared to controlled pre-antral follicle; eP<0.05 compared to controlled antral follicle; fP<0.05 compared to 12 h group; gP<0.05 compared to 24 h group. Table 1: Bcl-2, Bax, Fas and Fas-L expression in follicular granular cells. Figure 2: Expression of Bcl-2, Bax, Fas and Fas-L in follicular granular cells. A to C, E to G, I to K and M to O: PCOS group. D, H, L and P: control group. A to D: Bcl-2; E to H: Bax; I to L: Fas; M to P: Fas-L.
Limited number of oocytes exists during female lifetime. Depletion of reserved oocytes causes ovary aging and menopause. The fertility age is co-regulated by oocyte reserves, and their apoptosis rate [14-16]. A previous study has indicated the correlation of reproductive cells in ovary with ovarian atresia. The apoptosis of ovary cells mainly refers to granular cells . Animal study indicated the existence of abundantly apoptotic granular cells in atresia follicles of pigs . This study thus selected PCOS patients who received surgery, and tested the occurrence of apoptosis and related protein expression, in order to investigate the relationship between apoptosis and PCOS. After artificial ovulation, granular cells were separated for routine culturing. TUNEL assay was used to test the apoptosis of all follicular granular cells. Antral follicles in PCOS group had higher apoptosis index compared with pre-antral or primordial follicles. With elongated time (12 h, 24 h and 48 h), apoptosis indexes at all phases of follicles in PCOS group were gradually elevated. Moreover, PCOS group had higher apoptosis index at all phase of follicles compared with control group. These results suggested significantly elevated apoptosis of antral follicles in PCOS patients, which is consistent with a previous study showing the correlation between PCOS occurrence and apoptosis of ovary follicular granular cells . Follicular granular cells of PCOS patients showed abnormal differentiation, plus the enlargement of lateral granular cells at the side of oocytes, with filling of endoplasmic reticulum in cytoplasm, suggesting the potency for hormone synthesis of such granular cells. PCOS patients had undifferentiated pre-antral follicles, suggesting apoptosis of granular cells in those follicles . In addition, these patients also had dysregulation of FSH-granular cell axis, which causes apoptosis of follicular granular cells, and inability of androgen to form estradiol, leading to elevation of body androgen level, impairment of follicle selective advantage, as well as aggregation of small follicles to cystic formation inside ovary . In PCOS rat model, significantly potentiated apoptosis of ovary follicular granular cells was also observed, which is consistent with the present study . 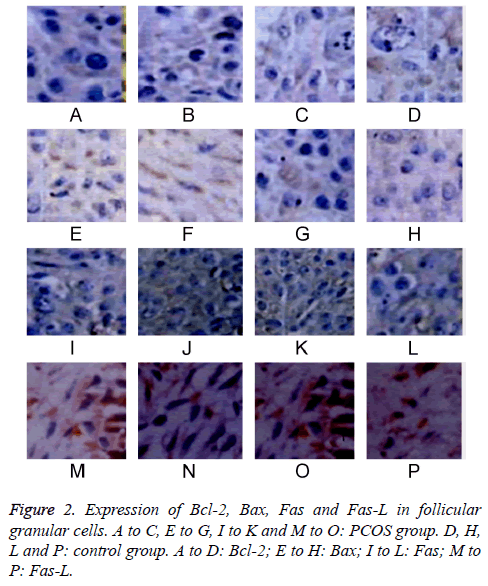 To further elaborate the changes of apoptosis related proteins in PCOS patients, this study revealed lower Bcl-2 expression, and higher Bax, Fas and Fas-L expressions in antral follicles in PCOS group compared to those in pre-antral or primordial follicles. Meanwhile, PCOS group had lower Bcl-2 and higher Bax, Fas and Fas-L in all phases of follicles compared with control group (P<0.05). With elongated time (12 h, 24 h and 48 h), Bcl-2 expression was gradually decreased, while Bax, Fas and Fas-L expressions were elevated, indicating the involvement of all these proteins in the apoptosis of ovary follicular granular cells. PCOS patients had elevated apoptosis of follicular granular cells, especially in antral follicles. Previous studies showed increased apoptosis of granular cells especially in antral phase by androgen intervention for human ovary follicular cells, accompanied with lower serum Bcl-2 levels in PCOS patients [23,24]. Under the stimulus of high level androgen, ovary follicles arrest the development and elimination of atresia, thus entering recruitment of antral follicles . Literatures have reported that elevated expression of Fas and Fas-L in follicular granular cells indicated the activation of cells, and gradual apoptosis. A basic study using human granular cells and luteinizing cells found Fas-mediated facilitation of apoptosis of those cells. Mouse study showed high expression of Fas in atresia follicles after treatment of chorionic gonadotropin for 72 h . This study indicated down-regulation of Bcl-2 and up-regulation of Bax, Fas and Fas-L in PCOS patients, leading to facilitation of the apoptosis of ovary follicular granular cells especially antral follicles. However, the major limitation of the present study was the relatively small sample size. In the future, large cohort clinical study is required to confirm these findings. In conclusion, elevated apoptosis is observed in ovary follicular granular cells of PCOS patients, which is demonstrated by reduced Bcl-2 expression and elevated expressions of Bax, Fas and Fas-L, indicating the participation of these molecules in the apoptosis of ovary granular cells in PCOS patients. These data suggest that therapeutically targeting apoptosis might be a novel approach for treating patients with PCOS. Glintborg D, Andersen M. An update on the pathogenesis, inflammation, and metabolism in hirsutism and polycystic ovary syndrome. Gynecol Endocrinol 2010; 26: 281-296. Glintborg D. Endocrine and metabolic characteristics in polycystic ovary syndrome. Dan Med J 2016; 63. Yin J, Gao Z, He Q, Zhou D, Guo Z, Ye J. Role of hypoxia in obesity-induced disorders of glucose and lipid metabolism in adipose tissue. Am J Physiol Endocrinol Metab 2009; 296: 333-342. Maciel GA, Baracat EC, Benda JA, Markham SM, Hensinger K, Chang RJ, Erickson GF. Stockpiling of transitional and classic primary follicles in ovaries of women with polycystic ovary syndrome. J Clin Endocrinol Metab 2004; 89: 5321-5327. Bas D, Abramovich D, Hernandez F, and Tesone M. Altered expression of Bcl-2 and Bax in follicles within dehydroepiandrosterone-induced polycystic ovaries in rats. Cell Biol Int 2011; 35: 423-429. Das M, Djahanbakhch O, Hacihanefioglu B, Saridogan E, Ikram M, Ghali L, Raveendran M, Storey A. Granulosa cell survival and proliferation are altered in polycystic ovary syndrome. J Clin Endocrinol Metab 2008; 93: 881-887. Azziz R, Carmina E, Dewailly D, Diamanti-Kandarakis E, Escobar-Morreale HF, Futterweit W, Janssen OE, Legro RS, Norman RJ, Taylor AE, Witchel SF. Positions statement: criteria for defining polycystic ovary syndrome as a predominantly hyperandrogenic syndrome: an Androgen Excess Society guideline. J Clin Endocrinol Metab 2006; 91: 4237-4245. Cataldo NA, Dumesic DA, Goldsmith PC, Jaffe RB. Immunolocalization of Fas and Fas ligand in the ovaries of women with polycystic ovary syndrome: relationship to apoptosis. Hum Reprod 2000; 15: 1889-1897. Onalan G, Selam B, Baran Y, Cincik M, Onalan R, Gunduz U, Ural AU, Pabuccu R. Serum and follicular fluid levels of soluble Fas, soluble Fas ligand and apoptosis of luteinized granulosa cells in PCOS patients undergoing IVF. Hum Reprod 2005; 20: 2391-2395. Cui W, Ma J, Wang X, Yang W, Zhang J, Ji Q. Free fatty acid induces endoplasmic reticulum stress and apoptosis of beta-cells by Ca2+/calpain-2 pathways. PLoS One 2013; 8: 59921. Tomlinson G, Chimalapati S, Pollard T, Lapp T, Cohen J, Camberlein E, Stafford S, Periselneris J, Aldridge C, Vollmer W, Picard C, Casanova JL, Noursadeghi M, Brown J. TLR-mediated inflammatory responses to Streptococcus pneumoniae are highly dependent on surface expression of bacterial lipoproteins. J Immunol 2014; 193: 3736-3745. Yu YS, Sui HS, Han ZB, Li W, Luo MJ, Tan JH. Apoptosis in granulosa cells during follicular atresia: relationship with steroids and insulin-like growth factors. Cell Res 2004; 14: 341-346. Teede H, Deeks A, Moran L. Polycystic ovary syndrome: a complex condition with psychological, reproductive and metabolic manifestations that impacts on health across the lifespan. BMC Med 2010; 8: 41. Kose SA, Naziroglu M. N-acetyl cysteine reduces oxidative toxicity, apoptosis, and calcium entry through TRPV1 channels in the neutrophils of patients with polycystic ovary syndrome. Free Radic Res 2015; 49: 338-346. Cai L, Ma X, Liu S, Liu J, Wang W, Cui Y, Ding W, Mao Y, Chen H, Huang J, Zhou Z. Effects of upregulation of Hsp27 expression on oocyte development and maturation derived from polycystic ovary syndrome. PLoS One 2013; 8: 83402. Rzepczynska IJ, Foyouzi N, Piotrowski PC, Celik-Ozenci C, Cress A, Duleba AJ. Antioxidants induce apoptosis of rat ovarian theca-interstitial cells. Biol Reprod 2011; 84: 162-166. Honnma H, Endo T, Henmi H, Nagasawa K, Baba T, Yamazaki K, Kitajima Y, Hayashi T, Manase K, Saito T. Altered expression of Fas/Fas ligand/caspase 8 and membrane type 1-matrix metalloproteinase in atretic follicles within dehydroepiandrosterone-induced polycystic ovaries in rats. Apoptosis 2006; 11: 1525-1533. Yan L, Wang A, Chen L, Shang W, Li M, Zhao Y. Expression of apoptosis-related genes in the endometrium of polycystic ovary syndrome patients during the window of implantation. Gene 2012; 506: 350-354. Skalba P. Progress in gynecological endocrinology. Ginekol Pol 2008; 79: 877-881. Jonard S, Dewailly D. The follicular excess in polycystic ovaries, due to intra-ovarian hyperandrogenism, may be the main culprit for the follicular arrest. Hum Reprod Update 2004; 10: 107-117. Figueroa F, Motta A, Acosta M, Mohamed F, Oliveros L, Forneris M. Role of macrophage secretions on rat polycystic ovary: its effect on apoptosis. Reproduction 2015; 150: 437-448. Garcia-Velasco JA, Arici A. Apoptosis and the pathogenesis of endometriosis. Semin Reprod Med 2003; 21: 165-172. Filali M, Frydman N, Belot MP, Hesters L, Gaudin F, Tachdjian G, Emilie D, Frydman R, Machelon V. Oocyte in-vitro maturation: BCL2 mRNA content in cumulus cells reflects oocyte competency. Reprod Biomed Online 2009; 4: 4309. Kalaiselvi VS, Krishna GP. The anti mullerian hormone- a novel marker for assessing the ovarian reserve in women with regular menstrual cycles. J Clin Diagn Res 2012; 6: 1636-1639. Dharma SJ, Kelkar RL, Nandedkar TD. Fas and Fas ligand protein and mRNA in normal and atretic mouse ovarian follicles. Reproduction 2003; 126: 783-789.